Sri Premika Varadan has given an assurance to Sri Swamiji that “Whoever comes here on Ekadesi, I never send them back empty-handed. I fill them with grace”. Madhurapuri Ashram is located serene and scenic village called Maharanyam, which today is known by the name Mahanyam. The Ashram was established here in the year 1991-92. At a time in the early 90s, when Sri Swamiji was in a wandering phase of his life, looking for a place where he could be in solitude, in a rustic environment, a Sadhu had invited Sri Swamiji for a satsang to this very same village. Sri Swamiji understood that Lord Krishna had showed him that place, as a vibrant spiritual centre from where Nama would prosper. Devotees of Sri Swamiji, then bought a small piece of land and offered it to Sri Swamiji, on which the main ashram campus stands today. It is in that place, that Sri Swamiji, in those initial days, used to stay in seclusion and be immersed in japa and dhyana, away from the bustle of the city, in a quiet and serene environment that he loved. There was a small room for him to stay and next to it a small goshala. This place, we later realised, is a spiritually vibrant bhoomi, with divine connections. Firstly, though called Mahanyam, the village’s actual name was Maha Aranyam. Legend has it that (there are many legends) Sri Rama and Sri Lakshmana, when they came south, spent three nights in this place during their exile. Aranyam meaning forest, is called Maha-aranyam because Lord Rama Himself has stayed here for three nights. Inside this village, there is a very ancient temple for Lord Rama. So, this place has a direct connect with Rama Avatar. Other connect that was established by research of archaeologists is, the direct link to Krishna Avatar. The historic place Manimangalam, nearest to Ashram, was an important town during the Pallava reign. There is a very ancient temple for Rajagopala Swami, which is very unique, because in Tamil Nadu ancient temples for Krishna are not many. There will be a lot of Siva temples and Perumal temples, but not many ancient Krishna temples. And by way of research, archaeologists have documented (published books to that effect are available) in which they say that when Bagavan was about to conclude Krishna Avatar and leave Bhooloka, on seeing the Yadavas get complacent, he ordains Dwaraka to be submerged by the sea and his own clan the Yadavas get destroyed. At that time, the others who lived surrendered to the great Sage Agastya and asked him to show them a way. Agastya brought the citizens of Dwaraka and settled them in a few places in the South. One of those places is Mannargudi and another is Manimangalam. So in both these places we find a temple for Rajagopalswami, who is Lord Krishna. So, in other words, the descendants are people who were citizens Of Krishna’s kingdom and hence the connect to Krishna avatar. The neighbouring Manimangalam village has a very ancient Rajagopalaswami Temple in which stone inscriptions can be found referring to this region as ‘Dwaaravati’ which means ‘Dwaaraka’. Thirdly, few kilometres away is Sri Perumbudur which is the avatara sthalam of Bagavath Ramanujacharya, the great acharya of Vaishnaviism. He gave Bagavan Nama to all. In fact, all surrounding villages were called ‘Bagavata villages’, because at his time, all of them were chanting the name of Bagavan. By Sri Swamiji’s Grace, Nama is flourishing here again now, in and around Madhurapuri, and across the world. Back then, when Sri Swamiji was in solitude, in very deep japa and dhyana, he has had visions of Srinivasa Perumal on the hillock opposite ashram, which we refer to as Madhurachalam. As if to corroborate that, many years later, in the village of Maharanyam itself there was evidence of old dilapidated murthis of Srinivasa Perumal, implying that from long ago worship of Srinivasa Perumal, that saanidyam, because of Ramanujacharya’s presence also, has been there. Based on this, Sri Kalyana Srinivasa Perumal temple was built, so that all of us can benefit from His Grace. In this way, even in the initial days of coming here, Shri Swamiji had many such visions. Under this ground where the ashram stands, several rishis continue to do ‘thapas’, which unable to be perceived by our eyes, many Mahatmas have seen. This is why in this place, so many spiritual activities are taking place. Nama Peetam, consecrated over crores of Nama written by devotees greets every visitor at the entrance. Diagonally opposite the Nama Peetam, is the Go Shala, Gokulam, which houses about 50 cows and calves. The beautiful kutir Madhuvanam is the abode of Sri Swamiji. 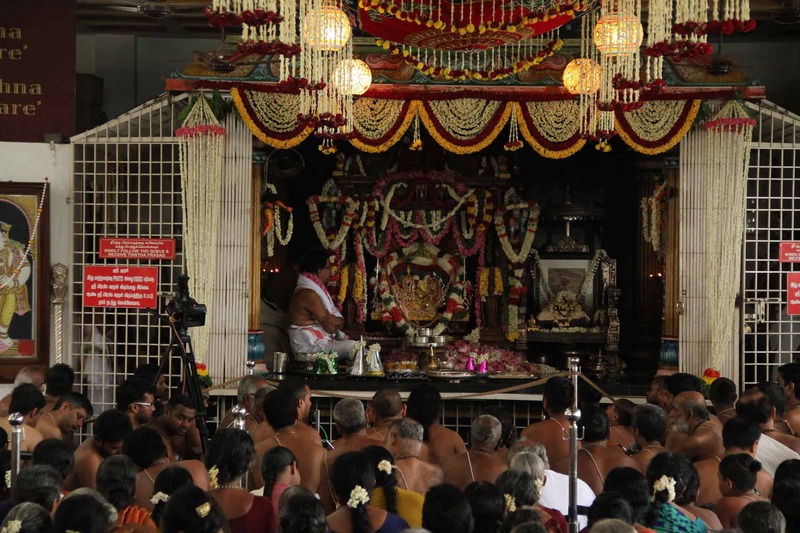 Kunja Bhavanam accommodates the Ashramites and Vedapatasala students. Sant Ekanatha Swami Dining Hall is a massive hall where annadhaanam is performed to all devotees who visit the ashram. Sri Sandeepani Gurukulam Vedapatasala is an important part of the ashram premises. Rightly named by Sri Swamiji, Bhagavatha Bhavanam, the ashram satsang hall is a place for incessant Mahamantra kirtan and satsangs. The Durbar of Sri Swamiji’s pooja moorthi, Madhuri Sakhi Samedha Sri Premika Varadhan (Sri Krishna-Sri Radha Rani) seated in their jhoola in an ornately crafted wooden mantap sanctifies the hall. Devotees circumambulate Namam Ketkum Perumal who stands majestically at the centre of the hall, chanting Mahamantra from 6am to 6pm everyday. This chanting commenced on 8th November 2006.